At the mention of Antigua, a stream of images floods the thoughts of those who have seen its many facets. They are like film rolls playing in sequence, and we never want to pause. 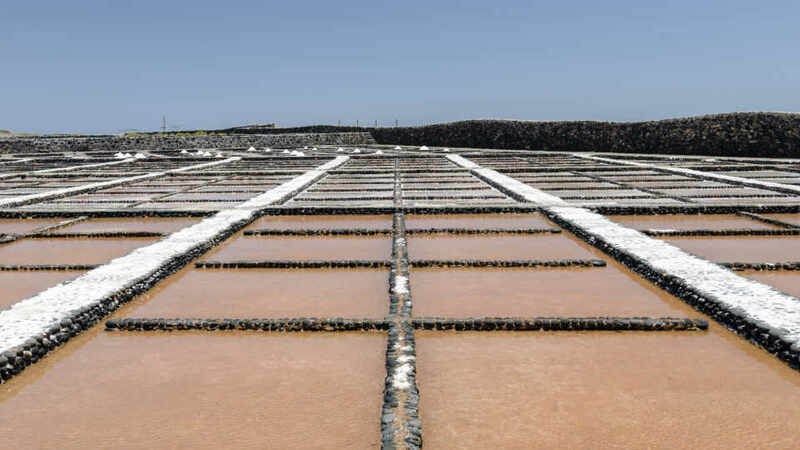 One of the standouts is Las Salinas del Carmen, and it’s for the most surprising reason – salt. When in this hamlet, the expression “take with a grain of salt” has a better taste to it. Most of the settlements in the Canary Islands began with the construction of a church or chapel. People then soon followed, and houses after houses. Las Salinas del Carmen, on the other hand, had a different start. Salt can be bought without any difficulty today. In earlier times, though, it was a very pricey and sought-after commodity. To ride the big waves of sea salt demand was most definitely a great idea. So, in the 18th century, the then Fuerteventura governor, Francisco Bautista de Lugo y Saavedra, ordered the creation of the salt mines. By early 20th century, the original salt mines were replaced by the ones surviving to this very day. Only a few minutes south of the glitzy and lively Caleta de Fuste is the humble Las Salinas del Carmen. Although a very popular day trip destination, it has preserved its serene state. Tourists who crave for even just a couple of hours of relaxation can undoubtedly get it here. The whitewashed houses sprawled in the hilly seaside are not of jaw-dropping architecture. Instead, they are simple and either traditional or somewhat boxy. To truly appreciate them, one must look at the entirety of the hamlet. Set on rolling landscape and facing the rugged cove of Playa El Muellito, the cluster of only a few dozen alabaster abodes is the very definition of tranquility. Even with eyes closed, the sound of the crashing waves gives the village undeniable charm. Aside from its calm ambiance, it also has some incredible sights to offer. There’s the chapel erected in 2009, the salt museum and a whole sweep of salt pans. After a circular driveway, a long footpath leads guest to the museum. Like the dwellings in the area, Museo de la Sal is also neatly painted in white. It is of uncomplicated style and design but also exudes clean elegance. Once inside, guests are welcomed by panels of colorful images and interesting information. Most people are blown away by all the unknown facts about salt. Who would have thought a readily available seasoning would have such a rich history? The gallery contains the biography of salt. And, let’s just say it had quite an adventurous and colorful past. There was even a time in the olden days when it was used as a currency. Presentations are also appropriately spread in different sections. There’s one area that showcases the significance of salt in the Canaries and the world. Another exhibit how different countries and places produce their salts. Its many uses and cultural contributions have dedicated areas too. The museum visit includes an outdoor tour of the El Carmen Salt Pans. Aside from the field of salt eyelets (tajos), it’s impossible not to notice the whale skeleton. Washed ashore on Majanicho beach in La Oliva, it was a carcass of a 19.5-meter-long fin whale. The Council of the Canaries then decided to erect it just past the wall that separates the saline to the beach. Salt production is not as simple as it may seem. For seawater to turn into salt, it needs to go through a three-step process. The salt water goes through the inlet tank (saltadero) which distributes it to the evaporation ponds (calentadores). Once in the basins, the sun and the wind will do their job and bring the water to the correct temperature. The concentrated seawater is then dispensed to the eyelets where more sun will dry up the water. After getting baked by sunlight, the salt is ready to be gathered and stored at the warehouse (almacen). Oh, and visitors get to learn all those with the music of the waves in the background. 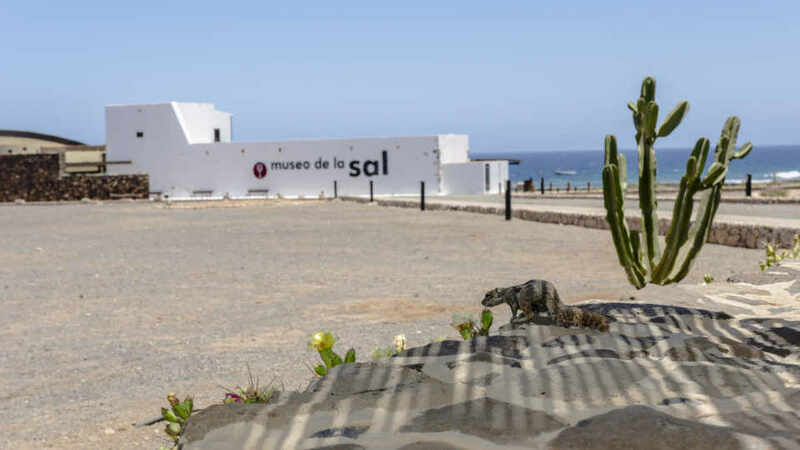 The entrance fee for the Museo de la Sal is only 5€. It already includes a tour of the Salinas de El Carmen and a booklet with English translation. Tourist can drop by from Tuesday to Saturday from 10:00 to 18:00. To reach Las Salinas del Carmen from the capital, Puerto del Rosario, tourists must take bus line 3. Visiting the little hamlet is so convenient as the bus stop is just between the salt museum and the beach. Also, it picks up and drops off every 30 minutes. Those coming from or going to Caleta de Fuste must take the same bus number. They may also walk or take a six-minute drive to the tranquil village if they prefer. At the moment, there are no hotels or any accommodations available in Las Salinas del Carmen. Caleta de Fuste, though, is only a few minutes away. Many vacationers even opt to take a leisurely walk or bike from the tourist mecca to the tiny village. The only restaurant in the hamlet is Los Caracolitos. Being the only option, though, doesn’t mean the food they serve is inferior to those in bigger towns. As a matter of fact, they are one of the most popular restaurants in the whole municipality. Some people even head to the village only to eat here, not for the museum or the beach. Their most famous dishes are the paella and fish of the day. Other must-trys include the grilled fish with papas Canarias (no mojo sauce), garlic prawns and squid, and breaded hake to name a few. Don’t forget to wash down with a cold beer and enjoy everything with the view of the clear azure sea. 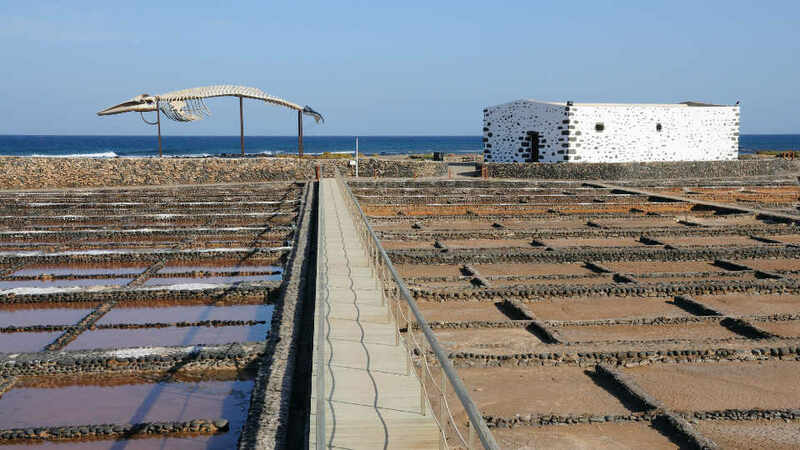 A visit to Las Salinas del Carmen is sketched to the memory of those who’ve been there. Not because the modest village is the most astounding place they have ever seen. It is lovely, don’t think otherwise. But, what makes it so memorable is the re-introduction of something we’ve always had in our lives – salt! It’s like finding out a different but better story about an old friend you’ve known all your life. Who knew “salary” originated from the Latin word “salarium” with the root word “sal” which means salt. How about its other uses that helped shape histories and cultures? It’s a hamlet that emerged from a number of salt pans. And, now, it’s that place people remember every time they reach for the salt shaker. They even tell a story or two they picked up from the trip while cooking with family and friends. Like salt, it’s that day trip that can make a vacation a bit tastier.